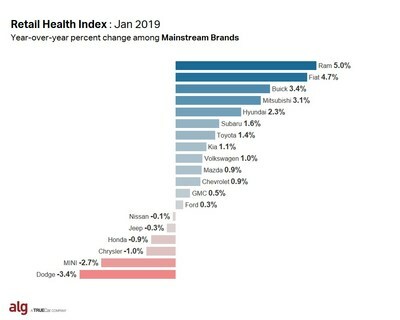 TrueCar's ALG introduces the Retail Health Index (RHI) to measure automaker brand health; Forecasts January auto sales to start 2019 strong | TrueCar, Inc.
SANTA MONICA, Calif., Jan. 25, 2019 /PRNewswire/ -- TrueCar, Inc.'s (NASDAQ: TRUE) data and analytics subsidiary, ALG, is introducing the new Retail Health Index (RHI) to measure automaker brand health. RHI strips away the impact of price cuts, to show which OEMs are growing retail share due to increased consumer demand, versus which are "buying" share through higher incentives. Looking at the industry overall, including fleet deliveries, TrueCar's ALG projects total new vehicle sales will reach 1,157,796 units in January, up­ 0.3% percent from a year ago. This month's seasonally adjusted annualized rate (SAAR) for total light vehicle sales is an estimated 17.0 million units for the month. Excluding fleet sales, U.S. retail deliveries of new cars and light trucks should increase 0.8% percent to 941,218 units. "Consumer demand remains robust in January 2019, with positive economic indicators offsetting concerns over the government shutdown and market uncertainty," said Oliver Strauss, Chief Economist at TrueCar's ALG. "Retail sales are up while incentive spending is down, supporting ALG's position that 2019 will be another strong year for the retail auto industry," continued Strauss. Incentive spending by automakers averaged an estimated $3,642 per vehicle in January down $33 dollars or 0.9% percent from a year ago, and down 3.1% percent from December 2018. ALG also evaluates average transaction price (ATP) as an indicator for its Retail Health Index. For January, ALG estimates ATP for new light vehicles was $34,274, up 1.9% from a year ago while incentives as a percentage of ATP was down 2.8%. "Ram stampedes out of the gates in 2019 with solid retail share growth and declining incentives as a percent of average transaction price. 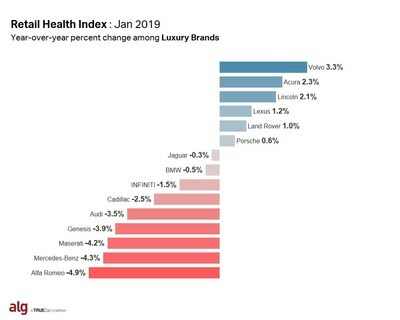 The result is the industry's largest positive year-over-year change in ALG's Retail Health Index," said Eric Lyman, Chief Industry Analyst for TrueCar's ALG. "We're curious to see if 2019 will be the year Ram puts Chevy and Ford to the test while also siphoning off sales from historical or aspirational luxury buyers," added Lyman. RHI measures the changes in retail market share relative to changes in incentive spending and transaction price to gauge whether OEMs are "buying" retail share through increased incentives, or whether share increases are largely demand-driven. An OEM with a positive RHI score is demonstrating a healthy balance of incentive spend relative to market share, either by holding incentive spending flat and increasing share or by increasing incentives with a higher positive increase in retail share. For additional data visit the ALG Newsroom.